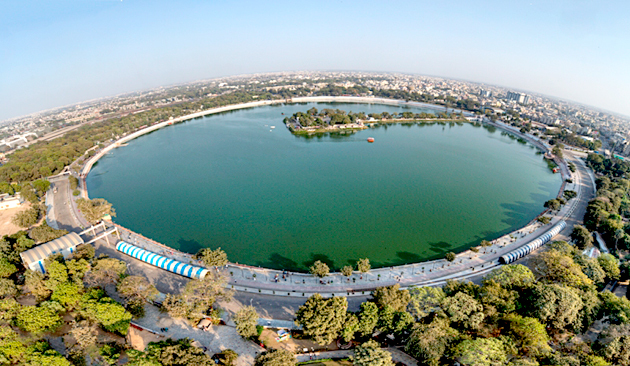 Ahmadabad, a major city and metropolis of Gujarat, straddling Sabarmati River represents a great amalgamation of old charm and new developments. It is a cosmopolitan city with a rich Muslim history full of stunning museums, amazing art galleries, fine restaurants and fabulous night markets. Many travellers stop off here briefly on route to Rajasthan or Mumbai but this pulsating city has much more to explore and enjoy. It is the fastest growing cities in the world and best city in India to live which shows its credibility. The city was named after Sultan Ahmed Shah who founded it in 1411 A.D is the commercial and cultural capital of Gujarat and has lot to offer to its visitors. Its local flavors, friendly people, sunny weather makes it an interesting place to visit on holidays. To enjoy this city of glorious past and bright future book low price tickets to Ahmadabad and visit a city of Hindu and Muslim influences, delicious cuisines and architectural delights. Sabarmati Riverfront is one of the ambitious projects of city which was recently inaugurated by state’s chief minister. It is essentially a paved embankment on either side of river which is meant for a lazy evening stroll. Decked with skyscrapers and buildings on it’s either side of riverfront resembles the likes of Singapore. It is a perfect place to enjoy a breezy walk which provides a great escape from the hustle and bustle of city. It comprises one of the most elegant and unique architectural complexes of Ahmadabad. At the time when Ahmadabad city was built, during the reign of Ahmed Shah, Sarkhej was a village with a population of weavers and indigo-dyers who were mostly Hindus. The village became associated with Sheikh Ahmad Khattu Ganj Baksh who was a Sufi saint and advisor of Sultan Ahmad Shah who lived till he was 111 year old and was greatly venerated during his lifetime. Myths about his miraculous powers are prevalent even today. It is among not to be missed site due to its splendid architectural style. If you feel hungry at night then don’t worry. The city has a great place for you when hunger strikes at midnight. Manek chowk is a street food paradise located in oldest quarter of Ahmadabad that serves as a leading jewelry market during daytime. According to a legend, it is the jewelers who encouraged setting of this street food stalls till the wee hours so that they manage a good night sleep. So make a visit to this bustling place and do taste some of its scrumptious delicacies. Established in memory of great freedom fighter Sardar Patel, the museum is located in the environs of Shahibaugh in Ahmadabad. It is also known as Moti Shah Mahal houses various portraits of Sardar Patel, his family members and friends depicting various phases of his life. The museum also has a national flag which was designed by the Indian National Congress in 1930-31. The surroundings of museum have a garden called Sardar Open Garden where you can see freely roaming peacocks. Sardar Open Air Theatre is a great place to visit where documentary films about the life and work of Sardar Patel are shown on different occasions. To explore many more amazing things about this hot favorite city of Gujarat, plan your visit now and business class flight to Ahmadabad and enjoy great time over there. When you are in city you just can’t resist tempting Gujrati thali. There are thali restaurants all over the state and most of them serve traditional vegetarian fare. From rotlas smothered with pure ghee to sweet rice puddings, your visit to city is not complete if you haven’t had the thali. So don’t wait, just go for it.